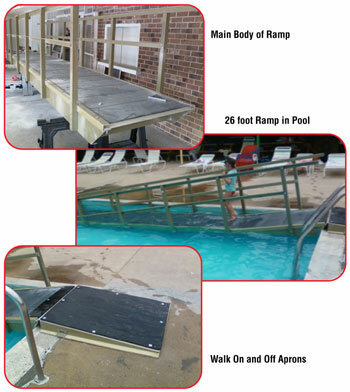 The Family YMCA in Bristol, Tennessee was outfitted with Strongwell’s fiberglass SAFDECK® decking, EXTREN® 500 Series tube and angle for a handicap pool ramp access in their outdoor center. The Family YMCA needed a light-weight high-strength product which was able to withstand constant exposure to UV light, chlorinated water, and constant usage. Strongwell’s pultruded fiberglass products met the pool’s needs perfectly due to its corrosion resistant qualities which maintain an attractive appearance while reducing maintenance costs. Strongwell’s SAFDECK® pultruded fiberglass decking, EXTREN® tubes and angles were selected by the pool’s property manager based upon previous applications. SAFDECK® was installed to serve as flooring and EXTREN® 500 series tubes and angles served as posts and railings. In addition to corrosion resistance, Strongwell’s materials also provided much needed skid resistance. SAFDECK®‘s fine grit surface provides a safe skid resistant walking surface in wet conditions.